Is displaced anger negatively impacting your relationships? This term describes anger that may be fueled by other stressors, but is expressed towards a specific target. Though this tends to be subconscious, it can drastically impact our relationships and can prevent us from receiving the support we are likely needing. The person who bears the brunt of this anger may struggle to understand where the anger is coming from, and can respond with distance, their own anger, or attachment injuries that impact future interactions. First, when you experience the feeling of anger, recognize that this is a sign that you have a need or a longing. Can you identify that need? Is that need directly related to the person you are expressing your feelings towards? Second, try to identify what else might be going on that is impacting your mood, patience, sensitivity, etc. Has “everything” gone wrong today (woke up late, spilled your morning coffee in the car, had a less than pleasant work meeting, got a flat tire, burnt dinner – the list can be endless some days!) and now your partner forgetting to pay that bill is the ‘straw that broke the camels back’? That’s okay! 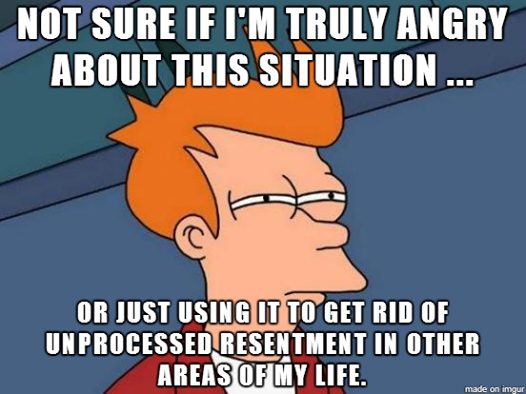 We all have things that set us up for displaced anger. Sometimes, simply letting your partner know that you’ve experienced these other stressors can help them hear your complaint about the bill a little less harshly, and can also help you acknowledge the build up without subconsciously reacting to it. Now we can discuss the bill a little bit more directly and effectively. Third, make repairs! If anger escalates and things don’t go well, take a time out and try to recognize any elements of displaced anger that occurred. Though we want to prevent these moments from happening, we are human and thus victim to imperfection. But taking accountability, making an apology, and repairing any of the hurt that was caused can help! Genuine repairs can help heal attachment injuries, create shared understanding, and foster connection in our relationships. Finally, be mindful. Between any stimulus and response is a space. Mindfulness helps us see and use that space to generate an appropriate response. If reactivity leads to displaced anger, mindfulness can help slow down, increase awareness, promote reflection, and allow you to more successfully use the strengths you have related to communication and problem solving. If displaced anger persists or has already caused significant relational problems, therapy can be a helpful resource to make the improvements you are seeking. Please let us know if we can help, or call if you would like a consultation regarding ways counseling can help you, your relationship, or your teen!